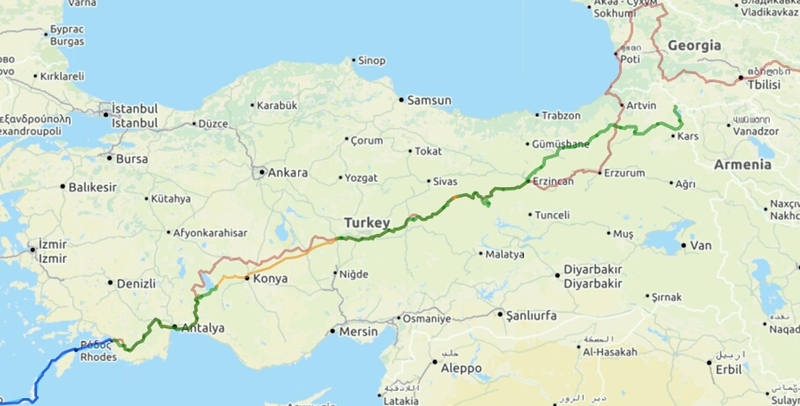 The first 10km east out of Antalya is pretty nice, along the coast and through lush green parks. The next 30kms is a different scene all together. These are the hotel resorts Antalya is famous for, growing in size as you head away from the city, the all inclusive palaces compete in size and stature with mock Persian temples, next to grand ‘chateaus’ or neon pink hip hotels. 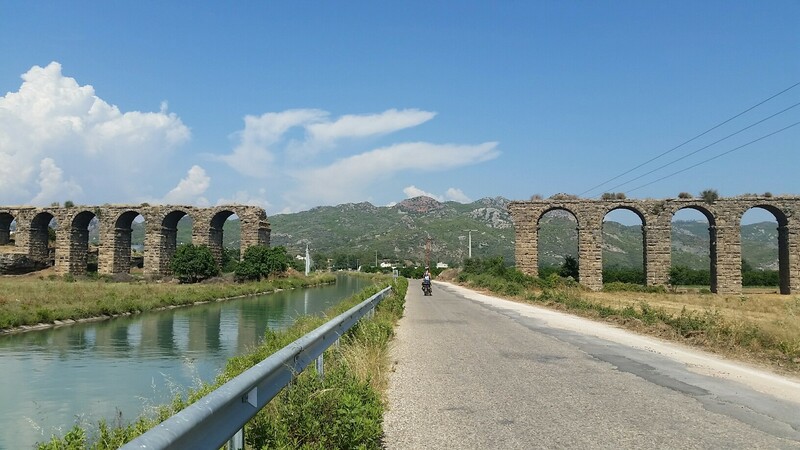 We were grateful for the fast flat road and happy to turn inland once more turning past Perge and Aspendos cycling through ancient Roman aqueducts and heading up towards Köprülü Canyon. 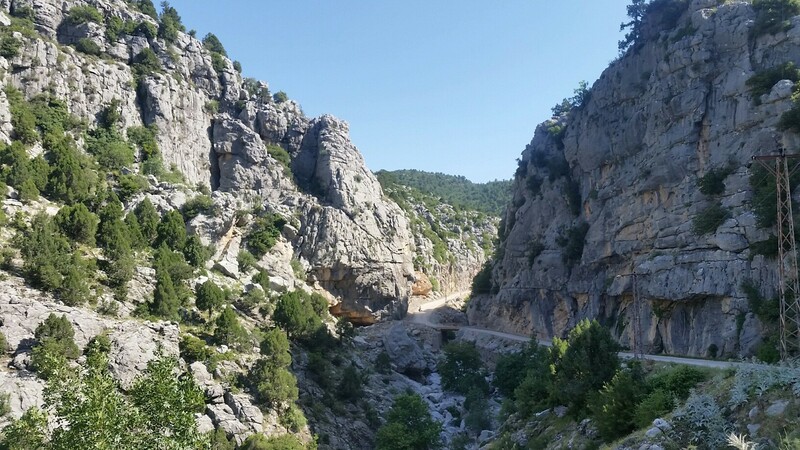 It’s a beautiful road up through the canyon and once you’re past the old Roman bridge the tourist traffic stops - it’s a popular canyon for rafting. Past this point shops are also in short supply but there was a restaurant marked on our map which we passed at lunch time, stopping even though it looked completely deserted. ‘Merhaba’ ‘hello’ we called out and three kids about 10, 15 and 18 came out. With some sign language and a trip to the ‘kitchen’ we worked out it was fish, salad and bread on the menu - we had little choice but to say yes and see how it would come. The 10-year old proceeded to fire up the stove and order the 15-year old around whilst the older kid just sat on his phone listening to music. We kept waiting for some adults to appear but more customers turned up and it was the younger two that did all the work. It was by far the best tomato salad we’ve ever had and the fish was pretty tasty too. An unforgettable lunch, the place even had wifi in the middle of nowhere! Fuelled we whizzed downhill but on the way up it wasn’t long before Jules discovered he had a flat tyre. It was so hot the tar was melting on the roads and a shard of metal had been pressed into the tyre. First puncture of the trip after over 5000 kms, not too bad. Stopping for water in Bucaği Jules did his best cow impression in an attempt to get milk (for tea & cereal in the morning) but they guy just thought we were mad so we got cherries instead! We looked up the word for milk soon after!! 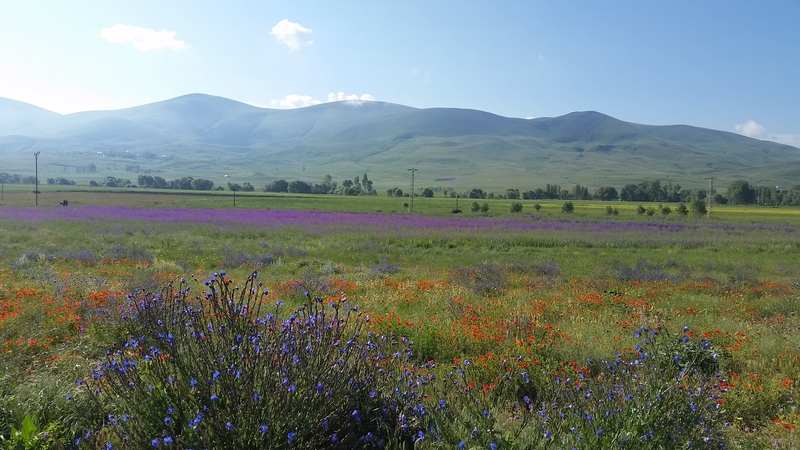 It’s a beautiful road from Yeşilbag to Kesme where we stopped for water before the big climb to cross over from Antalya province to Konya province. 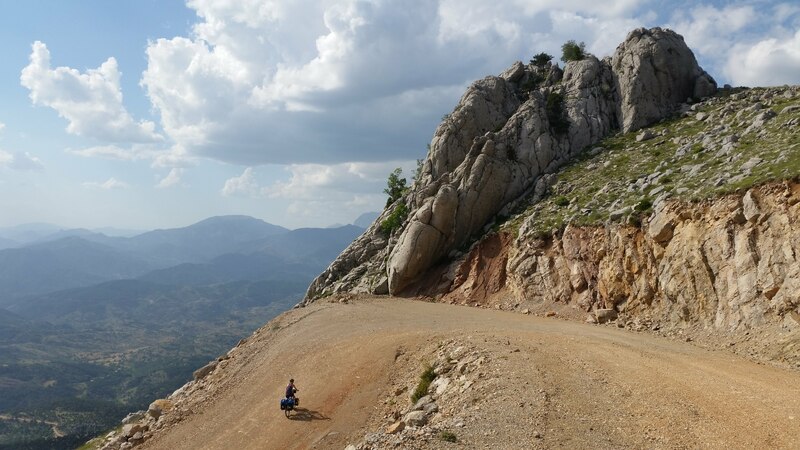 It was a road recommended by the motorcyclists we’d met near Antalya, a gravel track with steep switchbacks and absolutely incredible views across to snowy peaks. The surface was definitely better going up than down. We met another touring couple from Antwerp on their way up - we’re not the only mad ones! Nice to chat, we hadn’t seen any other cycle tourers since Greece. 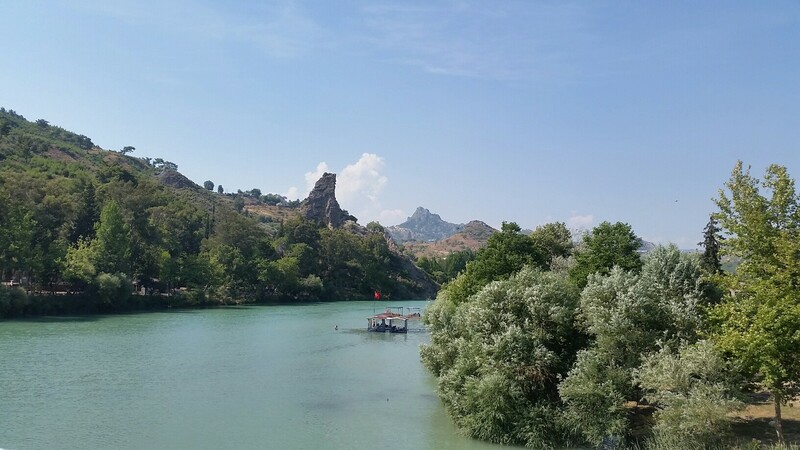 Views opened up down the valley to the turquoise lake at Beysehir where we took the bus (120TL) to Nevsehir to avoid the 300kms of flat, hot, nothingness along the Konya plains, and also made sure we’d make it to Baku in time for our flight. Turkey’s buses are first class with regular roadside stops and an on-board tea service! When buying our ticket at the bus station the Kâmil Koç staff said there was no extra charge for the bike. However, after a lot of hassle getting the bikes on, the driver insisted we pay him more - 30TL. He found a passenger to translate and said that our bikes were larger than the standard baggage allowance and therefore there was an additional charge. We paid it to calm him down but looking on the website later we couldn’t find any mention of excess baggage charges. They dumped us by a gas station on the motorway in Nevsehir (better than the bus station) and after a busy few kms out we had a magical ride into Göreme at sunset. We had high expectations of Capadoccia and it didn’t disappoint. 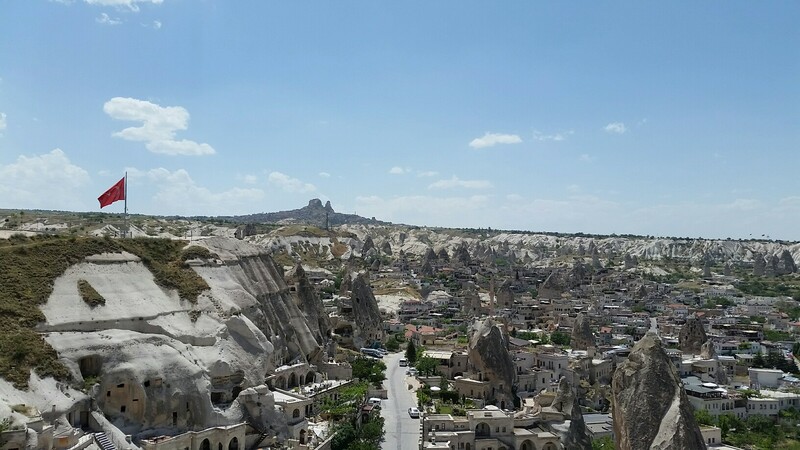 Göreme itself is just a tourist town but a good place to leave the bike and explore the magical rock formations and Bronze Age caves that surround the area. Göreme sat between rival empires for thousands of years: first between the Greeks and Persians; second between the Byzantine Greeks and their many rivals. 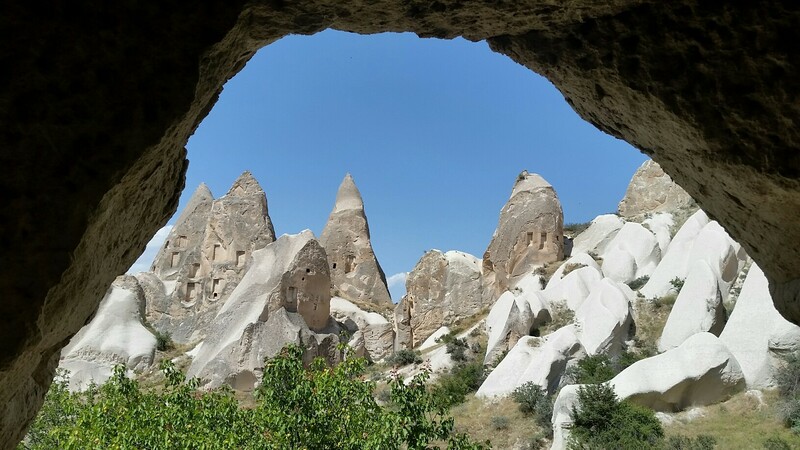 People literally dug into the soft rock to bury themselves away from conflict, resulting in the many fascinating caves and churches you can see today, surrounded by the eroded rock towers in shades of yellow, pink, white and red. We left Göreme early afternoon and headed up a steep cobbled road to the top of the Rose valley. Finding a hidden camp spot on a ledge in front of an old hot air baloon take off spot we watched the sun go down. Being woken at 4:30 am to the sound of dozens of hot air balloons firing up was exhilarating and watching them slowly rise down below, to the side and all around us was just incredible. A dream come true.